The KO Picture Show's entry to the "VS." Roundtable! Click on the banner above to read how the other reviewers enjoyed a little "Monstrosity y Monstrosity" action! "The U.S. version of this should be retitled, 'The U.N. News Turns Giant Monsters Fighting Into Liver & Onions!' 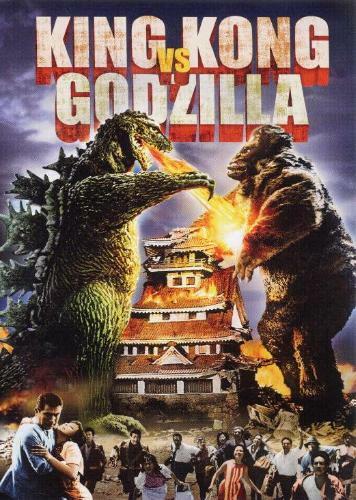 "
I can remember King Kong vs. Godzilla being my favorite giant monster movie as a child. I vividly remember the fight scenes between these two titans fueling many a re-creation by my brother and I in the backyard (similar to our pastiches of kung fu films from that fertile period of TV viewing back in the late 70's and early 80's; one could argue that the Asian film industry and the corresponding US distributors of that time period should be credited with the dearth of childhood obesity in that era, as compared to today. Apparently Pokemon or The Power Rangers don't inspire that same level of kid spaz-iness. Admittedly, we were also all hopped up on Hostess Chocodiles and Lick-M-Aid, but I digress...). One image in particular of King Kong force-feeding Godzilla an uprooted tree, root system first, was one that has stuck with me all these years. It was a tableau that captured my young mind and was giddily reenacted by whoever was lucky enough to play Kong in that backyard iteration of the scene. Bottom line: My whole reason for suggesting this roundtable was so that I could review one of the most beloved movies from my grade school years. Once again, my childhood memory has failed me. While memories of what was funny to me as child becoming less funny (or downright painful) as I've matured is a forgivable or (at least) understandable occurrence, my rose-tinted glasses for what was "teh awesome" from my adolescence being so violently ripped from my face is a bit surprising. How could I be that far off in my earlier assessment of the movie? Had the primitive, "giant-monster-smash-yay!" portion of my brain really atrophied that much in the intervening quarter of a century? Well, for one, I definitely don't remember the U.N. News reports. The U.S. cut of the movie starts with one (of seemingly hundreds) of inserts from the phlegmatic Eric Carter (played by Michael Keith), and they continue ad nauseum with a host of other field reporters and scientists (the most notable being Dr. Arnold Johnson as played by Harry Holcombe). Every appearance by Dr. Arnold signals a totally incendiary, non-fact-based edict on giant monster behavior. So not only do they bring the "action" to a grinding halt, but they're often totally nonsensical. Like we NEED a reason for the monsters? Let's just get down to the nitty-gritty, right?! Unfortunately the portions from the original Japanese cut are 85% more nitty than gritty. From the reviews I've read of the original cut, there were more attempts at broad humor (particularly from Ichirô Arishima, who plays the constantly mugging head of the Pacific Pharmaceutical Company, Mr. Tako) and a good deal more character development. In this one, we get right down to brass tacks (and those tacks are leavened with a healthy dose of U.N. News interruptions). The Pacific Pharmaceutical Company has discovered a particular berry that only grows on a remote, native-owned & operated spot called Farou Island. The juice from them packs a opiate-like wallop but are supposedly non-addictive, so Mr. Tako is frantic in his desire to snag these berries, not to mention investigate the stories of a giant beast that lives on the island, as he sees this as a fantastic marketing opportunity for his flagging corporation. So he sends off two of his top guys (Tadao Takashima and Kenji Sahara) to check it out. Meanwhile, the U.N. News informs us (whether we want them to or not) that an iceberg located in the Bering Sea is glowing and rapidly melting. One guess as to who's waiting inside the 'berg? In relatively short order (and coupled with unrelenting coverage by Eric Carter in the U.N. News room), Godzilla escapes from his snowy slumber, jacks up a U.N. sub (the U.N. has their own sub fleet?! ), and makes a b-line for the friendly shores of Japan. While the Big G does a little light stomp and burn, the PPC stooges have made it to Farou Island where they meet, in short order, the (at first) hostile (and apparently self-tanning lotion addicted) natives (who are easily placated with transistor radios and a few smokes), a giant octopus, some first-rate native chanting and boogying, and, finally, Kong himself. 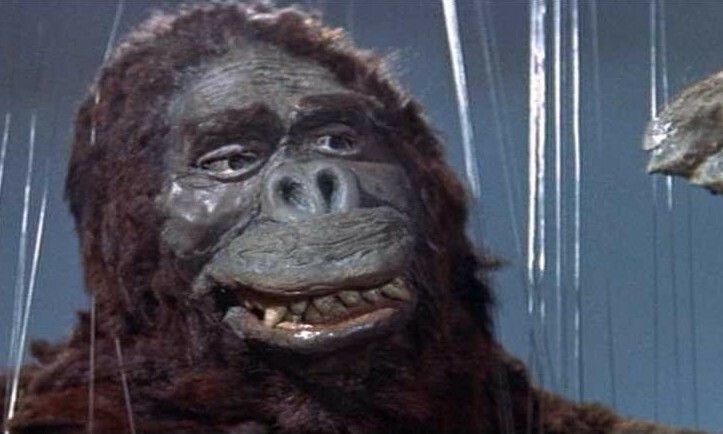 Much has been written about the, ahem, shortcomings of the Kong suit, and with the advent of the internet, I couldn't avoid pictures of just how bad this sucker is. Putting aside the patchwork body, the matted and assuredly stinky fur, and the comically floppy, elongated arms... it's that face that I can't get my mind around. When they go in for close-ups on that sucker, only one word comes to mind. Botox. 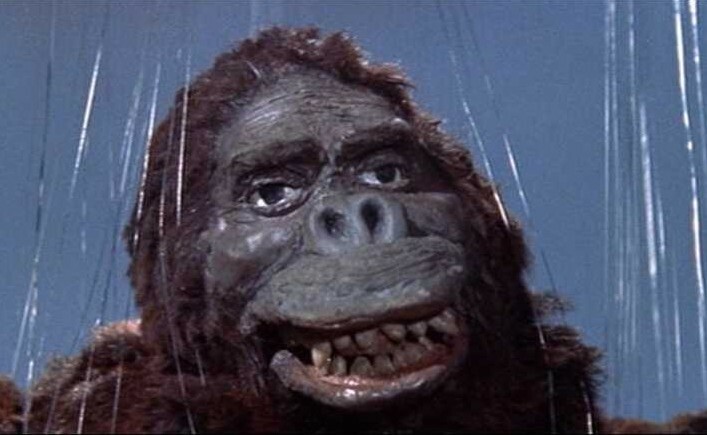 Kong looks like he's had a few botched facial procedures done, and now he's decided to augment them with some immobile, puffy lips. He's the Joan Rivers of the Kaiju universe! But I, again, digress. Kong helpfully does a few Faro Island shooters (roughly 3 silos worth of the stuff), and conks out. The Pacific Pharmaceutical guys truss him up on a makeshift raft and set sail for Japan. Now if you're like me, you're psyched because with Kong en route and Godzilla already trashing Tokyo, you're thinking that giant-monster-smashy-fighty time is only moments away! But you (and I) would be wrong! What we get is a bit of maritime bureaucracy, a pedestrian first meeting of the two monsters (it lasts maybe 3 minutes tops), some boring solo monster stomping around, and more U.N. updates than you can shake a stick at. I started to get that panicked feeling as the minutes ticked by and, STILL, no fighting between the two. Eventually the Japanese authorities decide that with both monsters producing so much individual carnage, and with their own military's efforts being (predictably) insufficient, that getting these two monsters together again to effectively destroy each other is their only hope. 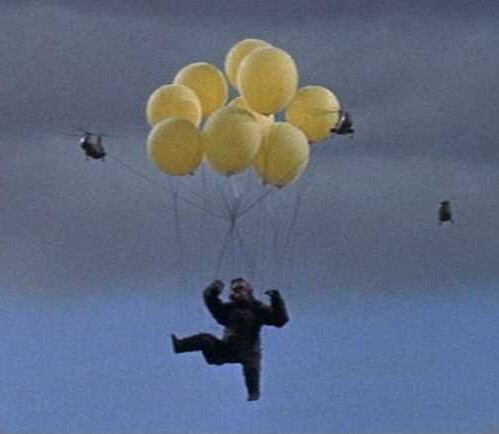 So they manage to once again sedate Kong, and then we get another of those iconic images from this movie, one that had been burned into my brain since I was probably about 7 years old... the sight of King Kong being air-lifted to a rematch with Godzilla by means of giant balloons. You don't forget the visual of a prone, unconscious Kong, floating along the Japanese countryside like a broken marionette, on his way to his fateful (and ridiculously short) final showdown with his nemesis. Too bad it's proceeded by 75 minutes of non-match-up action. What little we get in the way of fighting isn't terrible, but not great either. The men in the Kong and Godzilla suits (Shoichi Hirose and a combined effort by Haruo Nakajima & Katsumi Tezuka, respectively) are very willing to mix it up on the nicely rendered (and in the case of the coastline, pretty treacherous looking) terrain. With Kong only having brute strength in his arsenal (and, for this movie, some poorly conjured and ill-advised powers related to electricity) it's mostly hand-to-hand combat that we're dealing with. Unfortunately the enthusiasm of the men IN the suits doesn't translate to scintillating action ON film, and we get A LOT of the two monsters just rolling around. With Godzilla, it's most fun to see him shooting off that iconic radioactive breath, but it's kept to a minimum when aimed at Kong (as I'm sure he was highly flammable). Godzilla just helpfully surrounds Kong with fire, rather than applying it directly to his delicate giant ape flesh. Despite the paucity of actual contact between the two (save that final 15 minute battle at the end), I'm giving this one a 4-count. 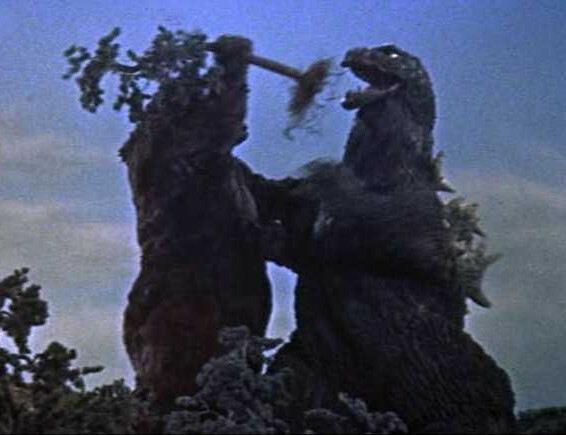 Mainly because that image of Kong uprooting a tree and stuffing it in Godzilla's piehole is some damn inspired stuff. Here's why you should never pass out at a Kaiju Frat party. He's lucky they didn't shave him. "I feel pretty, oh so pretty."